Parents know how to deal with reeking, stubborn, unpleasant things. So we need to get our gloves on. We need brownie power here, people. Thanks teachers, and, importantly, thanks parents! It’s so great that this strike thing appears to be wrapping up with a (tentative) agreement, and that we can all get our kiddos back in school and get back to our lives. We deserve to raise a toast — maybe even head over to one of those kid friendly wineries or land-of-many-beer stores for some beard-watching and a big, community-wide cheers. That’s a wrap, folks. Right? Yes, the Seattle public school strike is suspended now that the school board and union have come to a tentative contract agreement. The lunch boxes may now get packed. I sure hope I can sign my kid up for after-school Lego robotics … maybe if we’re lucky they’ll offer Coding 101 this year. I better get a spot. Oh, and we need to buy jazz shoes. When should we go Halloween costume shopping? Did you guys see that? I almost did it. I almost got caught up in the “it’s all solved” thinking. I almost breathed a sigh of relief. After all, haven’t we been through enough over the past week, what with all the child-care scrambling, picket-line marching, Facebook posting, and fielding of calls from family members in other parts of the country wondering what the heck is going on there in tech-savvy-Seattle-with-your-Microsofts-and-Amazons? Join a new grassroots citizens’ group, Washington’s Paramount Duty, sent a letter Monday to the Seattle School Board asking it to adopt a resolution urging state officials promptly and fully comply with the Supreme Court’s orders in the McCleary case (other school boards could receive a similar resolution from concerned citizens). Get involved in the Network for Excellence in Washington Schools (NEWS), a statewide coallition of 430 community groups, school districts and education associations, is fighting for full and ample funding of K–12 education. Contact your school board, your legislator, Gov. Inslee. Ask for pressure. Urge them to use their collective voices. Urge them to do their jobs, not matter how hard. Ask for a special session now. Meet legislators on their upcoming multi-city tour to tell them how you feel about education funding. I almost relaxed, but I am catching myself. Because the truth is, Washington state’s education problems ― which affect all of our kids — are not even close to being solved. The state Constitution mandates “it is the paramount duty of the State to make ample provision for the education of all children residing within its borders.” The State Supreme Court last year ruled in the McCleary case that the state is in contempt of court for the Legislature’s repeated failure to produce a court-ordered ample funding plan. A $100,000 a day contempt sanction is imposed. $100,000 every day. Yet state legislators have not fully funded education. The governor has not called a special session to do so. By getting Seattle teachers back to their classrooms, we in Seattle are putting a Band-Aid on. Unfortunately, our leg is falling off. The statewide wound is starting to fester. It’s all jagged and bloody and bone-sharp, and a Band-Aid, even a hard-won, well-deserved, really kumbaya Band-Aid that we should all feel grateful for and proud of, will not reattach this rotting limb. That is up to us. Not just parents, of course, but we are a big part of it. We are the engine that will push those in power ― the school boards, Gov. Jay Inslee, our elected legislators from all over the state — to get in gear and do their jobs. We were reminded of an important lesson during this strike: Without parent support and the actions of legions of moms and dads from north Seattle to south ― the muffins and coffee, the water and scones and pizza and fundraising and solidarity and Facebook profile photos of little red apples — chances are the story here over the past week would have turned out differently. But we love our kids, and we believe in education, and so we collectively acted to prop up and support striking teachers. The nation took notice, and it worked. Yes, we need to get to the firm end of the Seattle strike. But beyond that, we need to put that attention toward the larger problem. I caught myself starting to look away, because I'm salivating to get my kids back in the classroom. And because issues like budget funding and divisive politics and watchdog citizenry are not as fun as baking some brownies. But if we look away, we lose our chance. The momentum is building. After years of inaction, it’s time to force Washington to properly fund education for its 65 school districts. We are on the cusp of getting this right, and it’s our kids who stand to gain, or lose, everything. 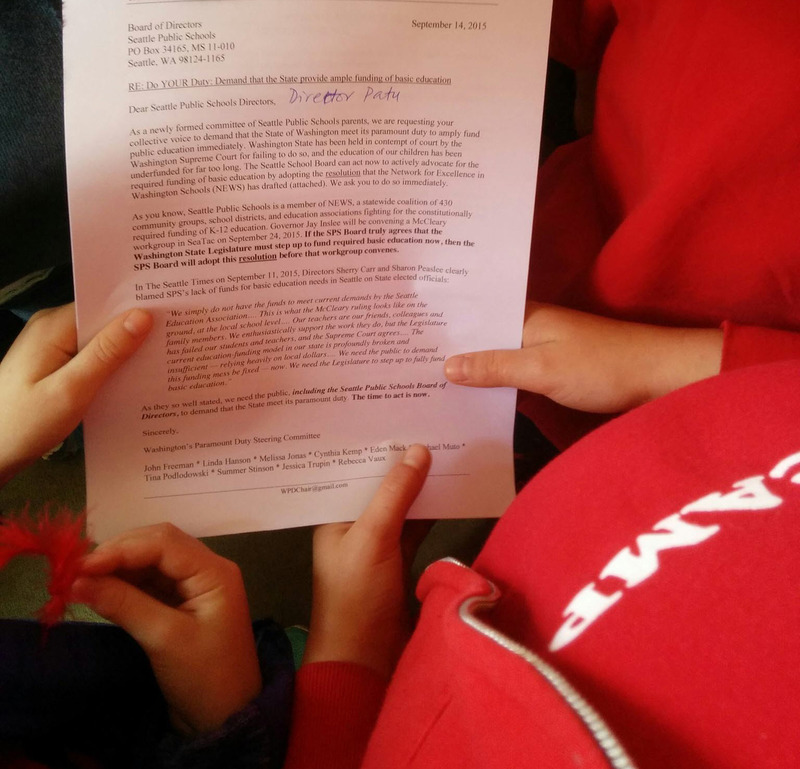 Kids deliver an important letter to the Seattle School Board. This is what I am telling myself: Sometimes this parenting business is boring (like when your child drones on and on about the millionth new Minecraft world she just built). Sometimes it’s frustrating ― “can you kids just stop bickering for a second? !” Sometimes it’s revolting, like the time my baby squirted mustard-colored poop all over our dog’s fluffy white coat, or when I had to clean out that humongous, pus-covered knee scab this summer. But we’re parents. We’re tough. We know all about not looking away. 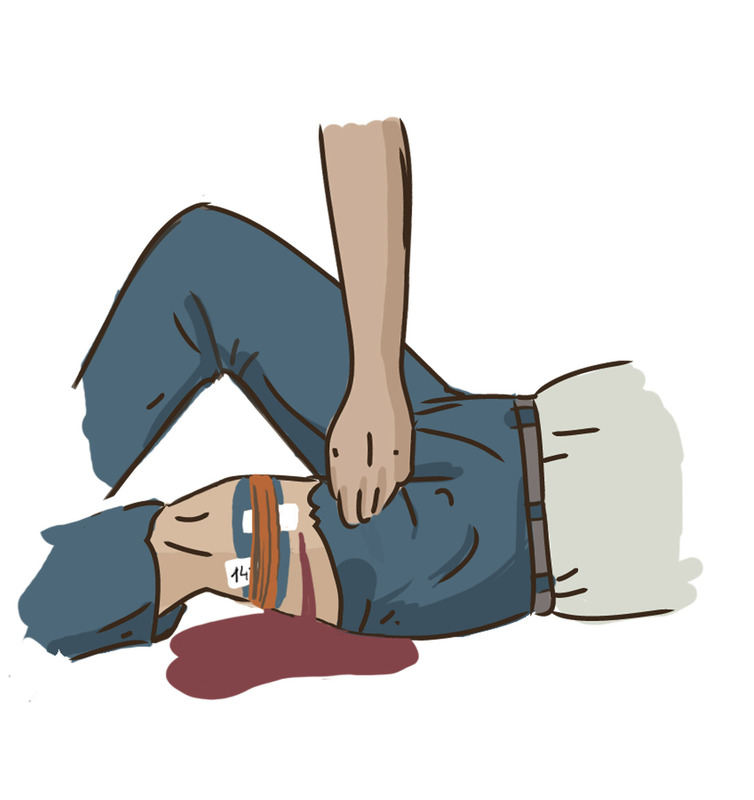 Not only can we bake muffins; we know how to pull off a gnarly, gross Band-Aid and clean out a wound so it heals right. We’ve got this.